Make your Website even more Secure with EV SSL Certificates! With a range of products that have launched and are yet to launch, we’ve finally added that extra ‘oomph’ to our website security products. That’s right, the most widely requested variant of SSL Certificates is finally live on ResellerClub! Extended Validation SSL (EV SSL) certificate, the highest available level of trust and authentication for a website is now on the ResellerClub platform. It’s the highest class of SSL available. Extended Validation provides the highest encryption level available and enables the organization behind a website to present its own verified identity to website visitors. 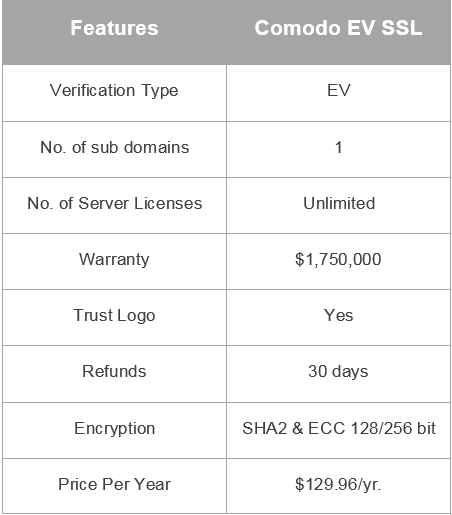 Obtaining an EV certificate requires verification of the requesting entity’s identity by a certificate authority (CA). A distinctive color, usually green, in the address bar indicates that the website has a valid EV certificate and instills confidence in the customer to complete the transaction. Websites that require identity assurance, online payment provisions (let’s take a major bank or a financial institution as an example) will surely need high level data encryption since they highly targeted by phishing attacks. A Comodo EV SSL certificate will enhance the trust between your customers and their visitors by showing a visible secure sign, the green browser address bar as mentioned above. The green bar, exclusive to EV SSL certificates, assures website visitors that they are transacting business on a highly secured, trustworthy domain. Thus, combining EV SSL certificates with your clients’ websites will not only fortify their online presence but also rake in higher conversions and repeat business!